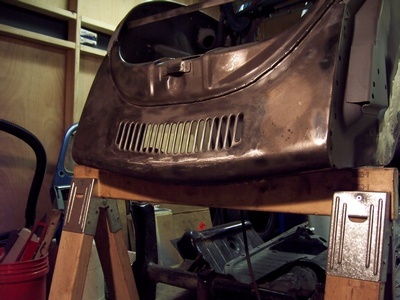 The restoration of a 1973 Volkswagen Beetle. Complete with a Subaru 2.2L engine, Porsche 944 Turbo brakes, and Porsche phone dial wheels. 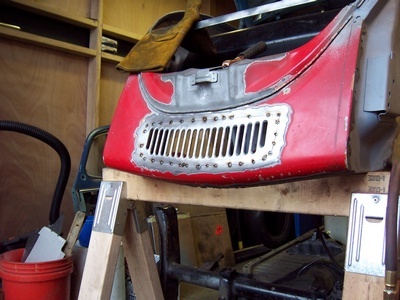 I finally came up with the idea of using a grill just like a super beetle. The problem with the super beetle is the grill up front is very rounded, and it just wouldn't work in this virtually flat apron. Then it hit me, I have a spare hood, and it's got the fresh air vents up top! Sure enough, I cut it out and it fits perfectly! 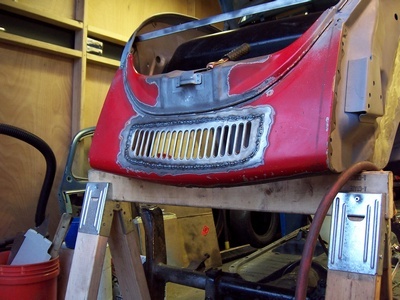 I really like how this is going to look, because it will match the one of the hood! Here are the first few welds. I'm being super careful here about heat and burn through. I don't want to alter these perfect vents. I couldn't only imagine how hard it would be to fix them. The finished product. I'm in love! I had that same idea for my subaru conversion! Great minds think alike, it seems. That's awesome Matt! Looking good! I see you're going to build up a spoiler underneath also. I'll be sure to keep checking out your posts over on Shoptalkforums!